In the 1940’s and 1950’s after the war when the world was getting down to the business of rebuilding lives and economies, workers had a very specific purpose. They would be classified as managers, secretaries, typing pool ladies or other labelled employees. With these labels came an work environment and every labelled individual had a very specific function to perform and this function was overseen by a manager who was in turn overseen by a director and so on. Enjoyment, creativity, innovation and work satisfaction were seldom discussed, it was all about doing your job, making a living, buying a home with a white picket fence and living “the dream”. 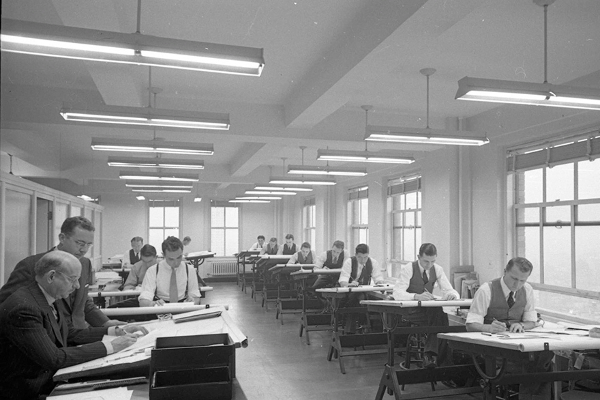 Take a look at this images of a work environments from the 1940’s or 1950’s. These are environments that are sterile, functional and look more like sweat shops. 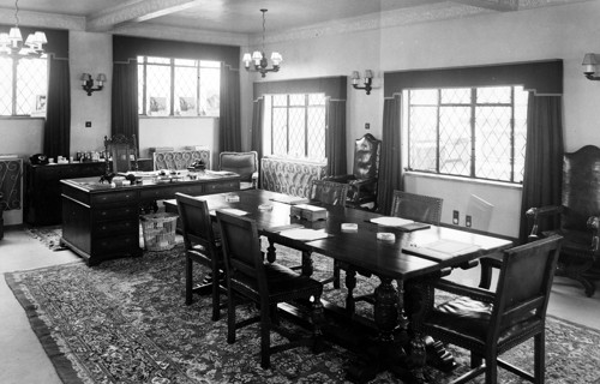 The Managers or directors offices were quite, serious environments where workers, work was checked and ticked and sent for further analysis or filing. Managers or directors were also the people who were perceived to know it all and do all of the thinking, innovating and instructing, often in offices like the picture below. Today the working environment is a totally different place where collaboration, interaction, enjoyment, creativity and innovation is nurtured and encouraged from all members, in all areas of the work force. It is unclear who started this revolution or even if it was intentional, but what has resulted is workers often seeking out a working environment and not so much a job any longer. In the past, there was very little time made for collaborating with ideas and employees often lived in fear of their bosses who held the key to the dream life. Some years passed before office buildings began to spring up here and there and everyone had their own office. In order to protect our intellectual tidings, we tend to pursue privacy in an office environment. Some even claim that this is the reason behind some people forgetting to greet others, and that we keep to ourselves in the work space. Every person’s personal office is a reflection of his or her personality, their sense of style and their work ethic. On the rare occasion the boss might even give permission to have the walls painted to the persons specific taste, let the employee choose his or her own furniture, all this is to ensure that the employee is motivated at all times to keep up their work performance and to encourage intelligent thinking. More often than not the designs of offices are designed to have the companies function and the budget reflected in the decor. There was only the basic office furniture, such as a chair, a desk and internet access. Did you know that in the 1940s employees were seated behind their desks in rows. This ensured that all employees worked as hard as the person next to them. In this day and age we now have cubicles. A cubical supplies some degree of personal space in an open plan setting. 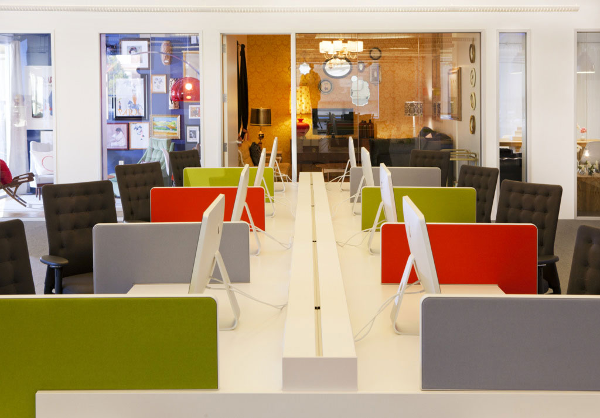 Can you picture this…..an open plan office with everyone on the same floor , including the managers, personal assistants and even partners in the company. It has become incresingly clear that not everyone needs to be stuck behind a desk to be productive in their work. More and more employers are accepting the work anywhere culture. If a sales rep had to sit behind the desk everyday and never going out to close deals, there would be no company growth. There are some people who are now working from home, and even on the road. All the smart phones and the wifi make it possible today to work from anywhere. The newest trend is called touchdown spots, and they are very popular with car dealerships. It is like a landing zone with a desk that supports things like e-mail, voicemail and basic filing thus the term touchdown. This solution is not for everyone though. Some people who are easily distracted and who perform better when there is silence will not fare as well with this system, while others can and the music and background chit chat will not be a problem. Companies who have the resources and flexibility to be able to support their employees in this new trend will only benefit in their success because building outside of the cubicle walls will definitely achieve a more pleasant and productive workflow.